Not one day goes by without the western press, whipping up the situation in the Persian Gulf, coming out with declarations concerning the current US government’s plans to attack Iran. For example, just a few days ago, the Australian television company ABC, citing a high-level source in the country’s government, announced that the USA is ready to launch strikes on Iran’s nuclear facilities, and that this could, apparently, happen as soon as August. Western media keep bringing up the subject of Washington’s possible plans to create a kind of “Arab NATO”- a new security and political alliance uniting six Arab states in the Persian Gulf, plus Jordan and Egypt. The creation of this “Arab NATO”, it is thought, should help these countries resist Iran and avert a number of Iranian threats. The Pentagon wants the countries that would form part of this alliance to cooperate more closely on anti-missile defense, military training, the fight against terrorism and other matters, including the strengthening of regional economic and diplomatic relations with the USA. There is the possibility that the creation of this union, also sometimes referred to as the Middle East Strategic Alliance (MESA) will be discussed at the summit planned for 12-13 October this year. “MESA will serve as a bulwark against Iranian aggression, terrorism, and extremism and will bring stability in the Middle East,” said a representative of the White House’s National Security Council, who emphasized that it was still unclear whether or not the plans for the security alliance would be ready by October. The White House also confirmed that Donald Trump’s administration is working with “our regional partners now, and have been for several months.” In other words, Washington, with the help of its Arab partners, who would be the first victims in the event of any conflict, is taking advance measures to encircle and punish Teheran for its stubbornness and independent policy. However, the new administration, like its predecessor, sees the world only in terms of US satellite states who are ready to carry out Washington’s orders at the drop of a hat, even if such orders go against their national interests. 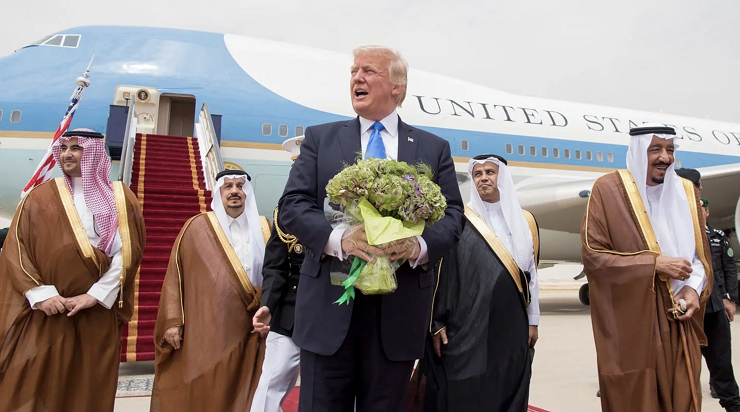 Other sources have reported that the plan for cooperation between the United States, the Arab monarchies in the Gulf Cooperation Council, and Israel is almost complete, and that over the last few weeks the parties have been finalizing the details. The final document could be ready in the first half of November, and then Iran will be faced with the critical issue of exporting its oil, and its threats already made against the USA and its allies in the region may become a reality. For example, the Iranian leadership has on more than one occasion warned that, in the event of a US attack, it will close the Strait of Hormuz, part of the route used by the Arab countries in the region for their oil exports. In those circumstances, oil prices would be very likely to increase sharply, and it is possible that this is just what the US “oil complex” intends, as it is seeking to boost the market for its own shale oil. It is worth remembering that Iran is the third-largest oil producer in OPEC, after Saudi Arabia and Iraq, and exports some 2 million barrels a day. In the last few years the energy sector, which counts ensuring the stability of oil exports as its number one priority, has accounted for up to 20% of the country’s GDP, over 80% of its foreign currency proceeds, and more than 50% of its budget revenues. Washington is insisting that other countries boycott Iranian oil, and is threatening them with heavy sanctions if they fail to do so. The fate of Iran’s oil sector will largely depend on the reactions of its key customers: China, Japan, India and South Korea. The USA is actively seeking to disrupt oil exports, a large proportion of which pass through the Persian Gulf to major Asian consumers, and thus the Iranian government risks encountering serious economic problems. Iran’s currency is already weak and the country suffers from low standards of living, high unemployment levels and other social and economic problems, all of which will take a turn for the worse if the USA extends its sanctions against the country and pressurizes its European and Asian partners to do the same. The USA fears that China, which considers that its interests are best served by following a policy of non-alignment, will step up its imports of Iranian oil. Washington admits that Iran will be able, to a significant degree, to make up for its lost oil sales to countries forming part of the US-led Iranian oil boycott by increasing its sales to Chinese customers. This will lessen the impact of the USA’s economic sanctions against Iran and also promote closer relations between Beijing and Teheran at a time when relations between the USA and China are particularly tense. But, Beijing, unlike its neighbors, has not yet given any sign that it will change its policy in relation to Iranian oil. “The unilateral sanctions against Iran are counter-productive in nature and must be cancelled,” declared a spokesperson for the Chinese Foreign Ministry in a press conference. With its hopes set on Beijing, Teheran is nevertheless preparing a wide range of other measures to fight the American sanctions, from radical steps, such as closing the Strait of Hormuz, used by tankers to transport Arabian oil, to market interventions such as permitting Iranian private companies to sell oil abroad. It is perfectly clear that after withdrawing from the nuclear deal the USA will start a campaign to put more pressure on Iran, not only through economic sanctions but also by fostering enmity between Iran and its military allies and supporting radical opposition groups that seek to topple the current regime in the Islamic Republic. Indeed, many experts, both within Iran and outside the country, believe that regime change is the Trump administration’s main goal in Iran. However, the current tensions between the USA and the EU have provided Iran with some breathing space, which it may be able to use to its advantage. Donald Trump’s hot-headed behavior to his allies, particularly within the EU, is alienating them more and more from Washington, and this is giving Iran some opportunity to maneuver. This became obvious as soon as the “trade war” with the EU broke out. This issue, as well as the fact that Europe continues to support the Iran nuclear deal and is trying to save it, have led to hopes that Iran may be able to find a peaceful option that would release it from the pressure being exerted by the USA. The White House’s ill-considered anti-Iranian policy, the President’s continual changes of direction, and Iran’s well-defined and clear position have all combined to bring the US President to a state bordering on hysteria. In answer to warnings from the President of Iran, Hassan Rouhani, that he “should not play with fire” and that “the Iranian people will never bow down”, Donald Trump totally overstepped the mark, firing off a shouty all-capitals response on Twitter, in which he told his Iranian counterpart never to threaten the United States. The head of the White House menaced Iran with terrible consequences the likes of which, in his words, few throughout history have ever suffered before. Moving on to direct threats, Mr. Trump’s continued: “we are no longer a country that will stand for your demented words of violence and death.” Previously, similarly hysteric tweets from the incumbent of the White House had only been directed against his political opponents in the Democratic Party, led by Hillary Clinton, or those involved in the investigation into his own conduct – the witch hunt, as Donald Trump refers to it – led by special counsel Robert Mueller. Military experts are now, yet again, making predictions and calculations about when military action against Teheran might begin. Everyone agrees that if things get to the stage of armed conflict then Washington and Tel Aviv will, in the end, be forced to use nuclear weapons, as it will be impossible to beat Iran using conventional weapons. Iran, meanwhile, will, with the support of its allies in Syria and Lebanon, be able to launch a number of precision attacks on Israeli territory and on the American bases in those regions. First of all, the American bases in Saudi Arabia will be destroyed, which would not be a difficult task. It would be even easier to attack the Americans in Kuwait, the UAE, and, most importantly, in their naval base in Bahrein, home to the United States Fifth Fleet. Qatar would probably be the only country in the region that would not get involved in that conflict: it has developed good relations with Iran in recent years and would have no objections to seeing its hated enemy Saudi Arabia suffer a defeat. It is probably no coincidence that the Americans have been rapidly expanding their air base at Al-Udeid in Qatar, which was already fairly large. The USA’s current policy towards Iran demonstrates that it now has far fewer politicians than in the past who are of sufficiently high caliber to be able to resolve the conflict by other means, especially by diplomacy. The American civil servants in Donald Trump’s administration think in terms of force, and threats of force, alone, and have no knowledge of alternative approaches to dealing with other countries and to resolving the many varied problems that arise between nations. However, in the modern world the balance between world powers has shifted, and Washington is no longer able to behave in the way it used to.